Call today for a rapid fixed cost for the repair or works you require. If you need further information regarding pricing, it's much easier to contact us on 0151 438 2297 or contact us using our online contact form. We charge per job based on the time it will take. Call us and speak to a friendly member of staff in our office. We can briefly discuss your requirements and book you an appointment. We will attend your property free of charge (some jobs will incur a £40.00 diagnosis fee, for example, boiler breakdowns - this will be discussed on your initial phone call) and we give you a free no obligation quotation. If the job is minor, we can normally quote and complete the works immediately. However, services such as a Landlord Gas Safety Certificate are a set price and would not require quotation. If you are happy with the quotation, we can book your required works in! Did you know we offer finance? We offer finance to our customers and clients. We offer 6-12 months at 0% APR and 24-60 months at 9.9% APR. When dealing with gas and water you require a reputable company to attend your property. Ensure the company is always Gas Safe and have reputable reviews. 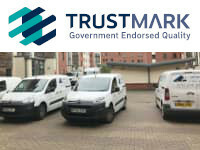 We are TrustMark Certified and a Which? Trusted Trader. We are the highest reviewed plumbing and heating company in Merseyside. We offer finance on all our services. The most common finance option is for a new boiler installation or bathroom installation. You can see further in-depth details on our finance options on our finance page. If you have any questions, please contact us. We're very friendly and helpful! If you require non-urgent work, for example, a bathroom fitting, we will visit your property and give you a quotation free of charge. We will visit the property and within three working days produce a quotation which can be emailed via a PDF document, delivered via RoyalMail or we can call you. If you are happy with the quotation, we will pencil you in for a start date. Again, we offer simplicity and no complications or hidden quirks! We accept Cash, Visa, Visa Debit, Solo, Maestro, Mastercard and Cheque (usually for over £500.00). Credit Cards are subject to a 3% charge. We provide all customers with clear, documented paperwork. This includes quotation, invoice and receipts. We provide them in a digital PDF format. If hard copies are required, we can send them via the post.